Losing Weight through Travel is my favorite way of dieting. Remember Europe and the rest of the world do not use the automobile as much as we do here in the United States. The food for the most part is healthier and better made, especially if you're used to going to fast-food restaurants for most of your calories. There are less processed foods and, hopefully, a reduced tendency to drink sugary soft drinks. Small deli's, bakeries, and restaurants make it easy to choose foods that are healthier. In fact the rest of the world looks like one great big stair master exerciser. Who needs a workout at the gym for losing weight, when you have entire city of London or Paris to explore? You don't need to swim laps, when you spend entire days on Mediterranean shores or on the beaches of Rio de Janeiro, Brazil. Many places and cultures around the world do not snack between meals as much as Americans do. So fitting in to other cultural schedules can reduce calorie intake without really trying. Furthermore, you can take vacations that involve real exercise. This includes hiking through the Alps, bicycling through the Benelux countries, or climbing in the Himalayas. That should take a few pounds off. 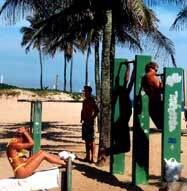 Try joining the beautiful people and workout in the open air gyms on the beaches of Brazil or California. Plus there are opportunities to volunteer around the world. Building homes for the poor in South America or picking grapes Italy can be quite rigorous. Try learning to ride horses with the gauchos of Argentina or riding herd in New Mexico with the other city slickers. One more suggestion is to find a Greek or Spanish Island someplace and dance the night away, every night for a few weeks. That might also do it. Remember there are plenty of ways to travel and lose weight. Find a way that suits you!